The welcoming vibes at this neighbourhood café keep ’em coming back. STARBUCKS with sarongs” is not how I would describe Artisan Roast TTDI. But it’s satisfactory enough as an introduction. I’m not even sure the staff wear sarongs all the time these days. My first visit to Artisan Roast was an adventure. I almost got lost. Part of a café concept founded in Scotland, Artisan Roast KL is run by Michael Wilson and Amirah Mohd. Artisan Roast (AR) sources, roasts and packs its own beans and, back at its old place at Yayasan Seni Berdaftar (along Persiaran Jalan Ritchie in KL), none of their beverages were priced above RM10. The fragrant brews, made from freshly ground Brazilian Carmo beans, needed no sweetening either. Even after the coffee had cooled way down, the thick lines of latte art and the foam they sat on held firm. The coffee was good. The atmosphere was good. But we never went back. Nor could we. As it’s often the case these days, the news came from Facebook. Its new digs at Taman Tun Dr Ismail are bigger, better equipped and more comfortable, being air-conditioned and all. With a proper kitchen, meals and other stuff can be made from scratch as advertised. Located next to the big Maybank branch on Lorong Rahim Kajai 14, TTDI’s well-known nightspot strip, it was easy to find – unlike parking. And unlike the old days when it was in YSB, Artisan Roast TTDI has a larger, steadier clientèle. Good, because the place needs the business. However, gone are the serenity, open spaces and clean air. Will it become a victim of its own success as the crowd swells? 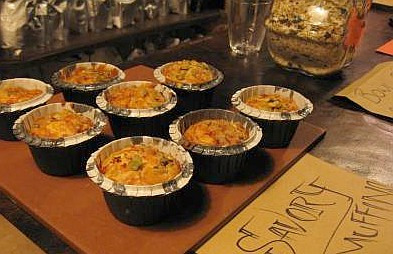 Savoury muffins made in the scratch kitchen. In keeping with the artisanal vibe of the brand, AR’s interior has fewer polished lines and surfaces than most modern cafés. Tall benches and chairs and tables that are more like wooden beams emanate a bar-like feel. A nook of low tables and cushions at the back provides more space for family gatherings and meetings. Most of the walls are bare brick, save for some surfaces decorated with murals, some of which are half-finished. When the baristas get to work, expect half the room to smell real good. Drinking coffee or tea here feels more natural. AR is essentially a bar for teetotallers. I was also told that some bar-goers in the area drop by for a caffeine jolt to help stretch their nights. 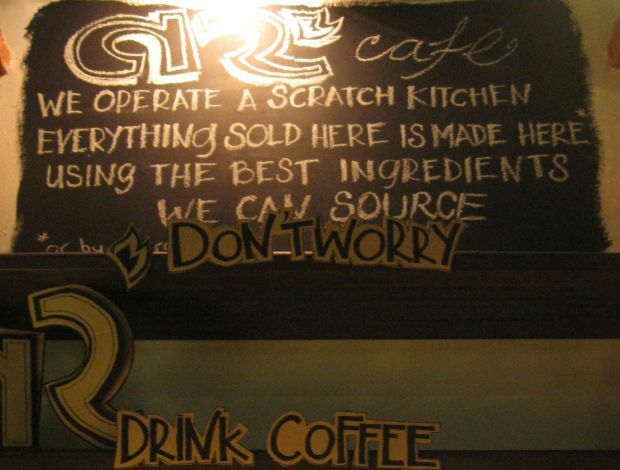 AR serves its own cakes, pastries, sandwiches and savoury muffins. But the à la carte menu is limited. At the moment, you can choose either eggs on toast or pancakes with caramelised bananas and whipped cream, sprinkled with cinnamon, both cooked from scratch. It’s worth the wait. The menu is also evolving, bringing the promise of more scratch-kitchen yummies in the future. Everything in the display chiller comes out from the kitchen as well. The Sicilian Apple Cake seems popular; one night I was there, they sold five slices within an hour. Each rustic-looking slice looks like a cluster of apple cubes and sunflower or pumpkin seeds held together by a bit of cake sponge. I bet one slice of their Carrot Cake can improve your night vision straight away. 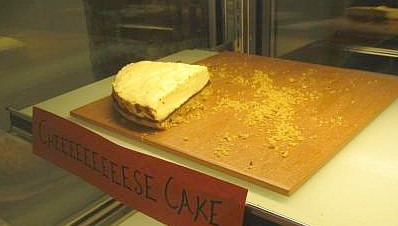 Other tasty treats include the Cheeeeeeeeese Cake which is worth every “E” and every sen you pay. I’ve found that The Zesty Lemon Slice goes particularly well with hot coffees. The Millionaire Shortbread was nice with its layer of chocolate and all, but my preferences lean towards hoi polloi shortbread. I shan’t say much about their coffees. Crowds don’t lie, they say. If you’re curious about what they’re serving, ask the barista. Beans that have had their turns in the hopper include Sumatran Mandheling, Rwandan Musasa, Ethiopian Yirgacheffe, El Salvadorean La Guachoca, and those from the Fazenda Lagoa do Morro in Brazil. I’ll let them tell you what the differences are. AR also serves Red Espresso, rooiboos tea that’s prepared like espresso. The Red Latte is a great pick for caffeine-free nights – simply the most luxurious, sublime teh C kosong I’ve had. Another non-caffeine diversion is the Smoovie, AR’s special concoction of banana, yoghurt and cinnamon. Those were the only ingredients I could taste. Nowadays, I spend at least a night or a weekend afternoon at AR, nursing one of their beverages for a while before washing it down with free filtered water. Prices are also reasonable: Most of their beverages go for between RM5 and RM10 and cakes/pastries are between RM2 and RM10. One can also pay a little more to go lactose-free with Bonsoy. Plus, the benefit of a (supposedly) cooler crowd. But I miss the quiet. And the playlist needs more tunes.